It is time yet again to wish my dad a happy birthday. So, Happy Birthday Dad, have a good one! The numerous times I have seen these cute and adorable mice from Stampendous Stamps, which in fact have been created into so many amazing cards and other such items left me craving to own a few myself. Hence an order was placed and I am now a proud owner of not one but three House Mouse stamps, along with one of the matching sentiments. 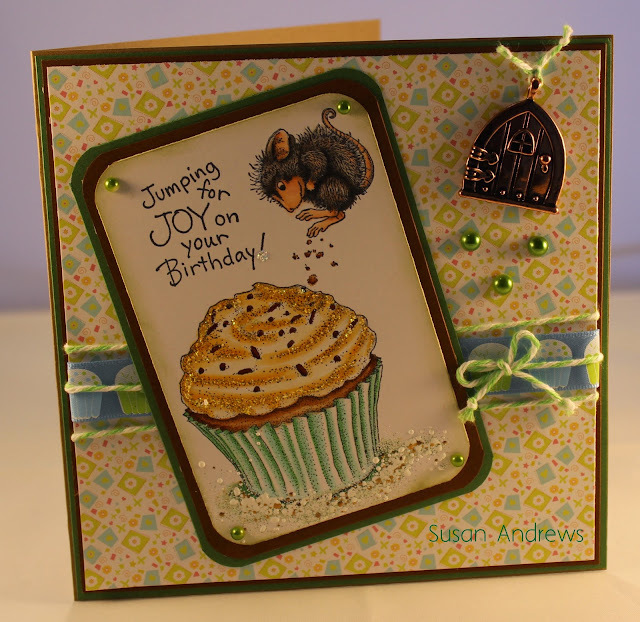 Today's little critter is none other than Cupcake Jump, (quite the obvious name for this delighful stamp). This particular image was paired up with the wonderful matching sentiment that I formerly mentioned. Even though these mice are adorable I certainly wouldn't want one jumping on my cake no matter how cute they are. Fortunatly for him he has an escape route through his fancy mouse door if need be.